The chicken or the egg is a hypothetical that’s become a bit of a standby cliché. Well, we’ve got a new one with a Spanish twist for you when it comes to the Pago de Carraovejas winery in Ribera del Duero: What came first — the suckling pig, or the wine? Unlike the avian version of the question, in this case, the suckling pig clearly was the first part of the equation, but the wine was the final part to complete Jose Maria Ruiz’s sum. With a successful restaurant in Segovia specializing in cochinillo, the famed Spanish suckling pig, Ruiz was sick of trying to find wines that paired with the food he had mastered. So, he created his own. My signature dish is the cochinillo, and the idea was to create a wine that would marry perfectly with the cochinillo. Out of that concept, I created the wine that would go perfectly. 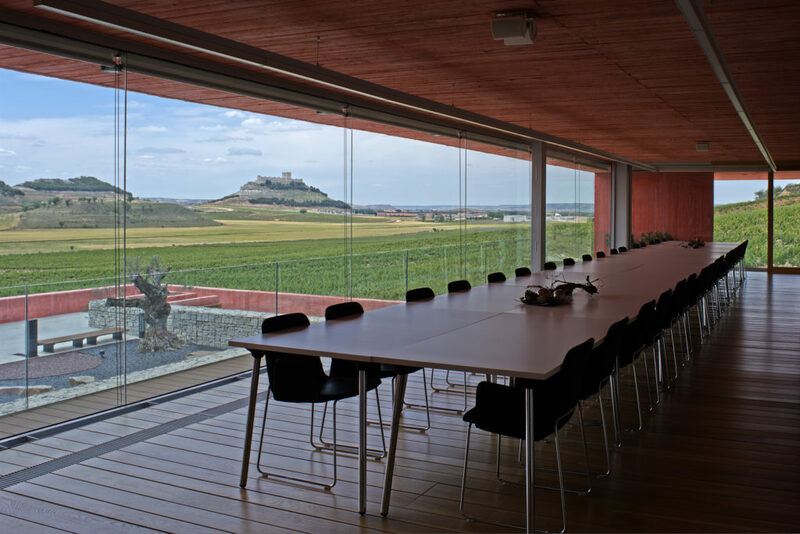 With the success of his restaurant, Ruiz was able to start Pago de Carraovejas, which boasts what might be the most glorious view in Ribera del Duero thanks to its proximity to the Castillo de Peñafiel. It’s the kind of view that will make you question what you’re doing in life and wonder if you should pack it all up, move out into the countryside and do things the old-school way. With Ribera del Duero still in its infancy in terms of being a well-known wine region, Ruiz did things the hard way, as chefs often do. Rather than scoop up an existing, tried-and-true vineyard, in 1987 he planted his own vines so that he could control everything, from the direction the vines faced to the clone of grape. My goal in life is to make people happy. I’m happy when I see others are happy and enjoying things. “Because of the slope where the winery is, south facing, it receives the sun the entire day and is very warm. That is where the shepherds in the area kept their sheep during the cold winter months,” Ruiz reflects. Since his first harvest in 1991, the results have been stellar, with Pago de Carraovejas earning rave reviews and expanding to nearly 500 acres of vineyards. “I think the Ribera del Duero Consejo is doing a good job in setting the rules in production in order to ensure the quality, and I think there will be entrepreneurs there that will maintain the relevance of the region throughout the world,” Ruiz says. In those age-worthy examples of Tempranillo is where the grape shows its full potential. That potential winds up in upwards of 750,000 bottles of Pago de Carraovejas each vintage, each one with the dual intentions. While Ruiz will tell you all he wanted to do was to make wine that paired well with his infamous cochinillo, when you dig a little deeper, you get to the core of why he got into the restaurant and wine industry in the first place. In 1987, Jose Maria Ruiz and a group of wine-loving Segovians created a winery in the hillsides of Carraovejas, in Penafiel. The land enjoys a microclimate created by the sweetening influence of the Duero River, the dominant west winds that keep the vines healthy and the south facing aspect of the softly rolling hillsides, sheltered from the damaging effects of the north wind and devastation from the spring frosts and autumn freezes. The perfect conditions for a thriving vineyard: sun and air. Fermentation is carried out in small stainless Steel vats and French oak vats (Haute futaie) with yeasts and bacteria found at the estate to show the terroir�s unique characteristics while respecting each vintage�s singularity. It is clarified with natural egg whites and gravity bottled. Selected natural cork stopper. April 2014. Then it aged on the bottle.